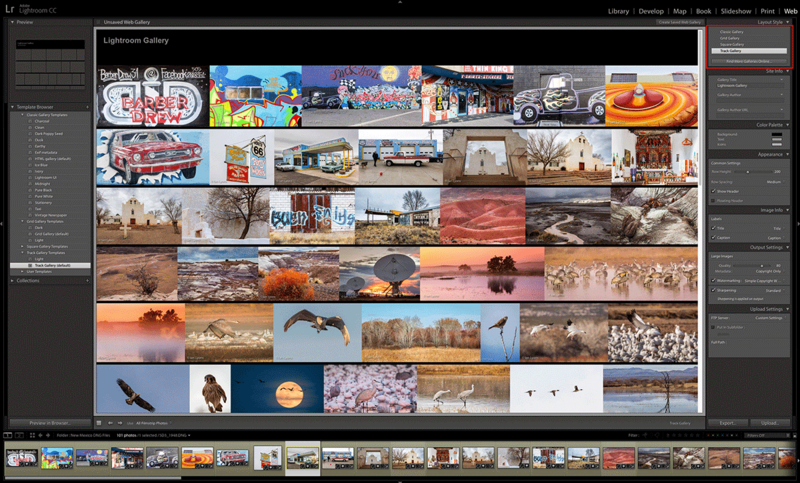 Adobe has today (21 April 2015) announced availability of the latest version of Lightroom. The question on many users minds will be - has the wait for been worth it. So what's new and enhanced? Unlike previous versions of Lightroom, Adobe did not release a public beta of Lightroom 6. As a result, there has been no opportunity for existing or new users to try out the new features or make suggestions for others. Whether you agree or not, I think this has allowed Adobe to focus on fine tuning the new features instead of trying to manage the unrealistic expectations that previous public betas tended to generate. Lightroom 5 was predominantly about Develop module enhancements such as the Radial Filter, automated Perspective and Lens Corrections plus some important workflow improvements within the Library and Book modules. 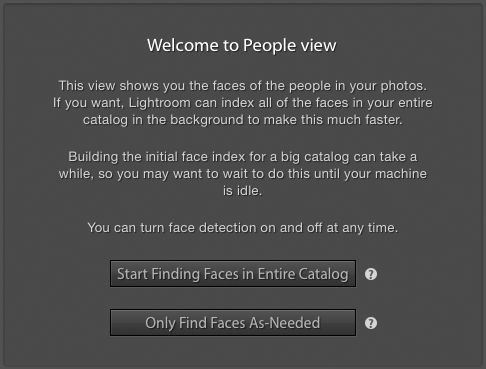 This time round the Lightroom team have largely focused their attention on Facial Recognition and Slideshow. Obviously, these aren't the only new features, but they are the most notable. 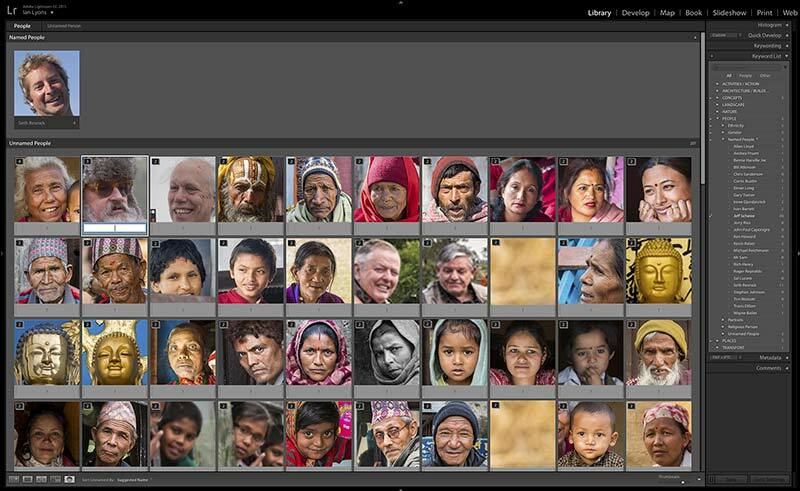 I expect the inclusion of Facial Recognition should please a relatively vocal section of the Lightroom user community who have for some time questioned why Lightroom didn't include support for Face Tagging. At the same time the Camera Raw team have been working hard to incorporate Photo Merge into the raw workflow. 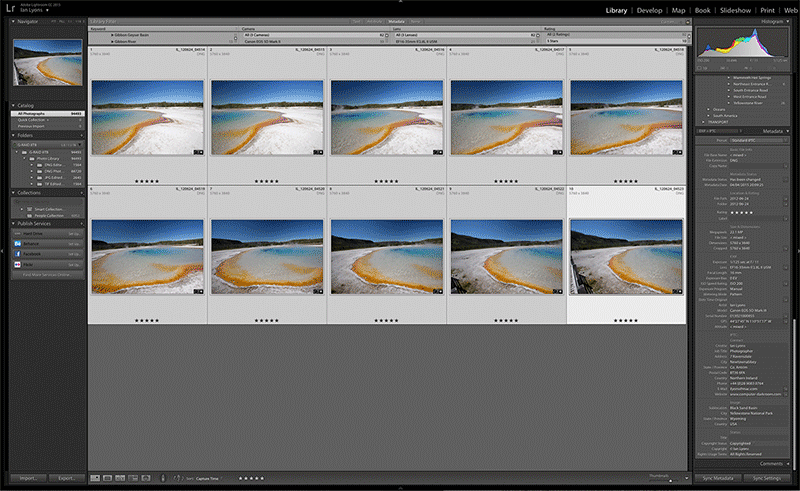 This means that Lightroom now supports merging of multiple raw files into a single raw HDR or Panoramic image. 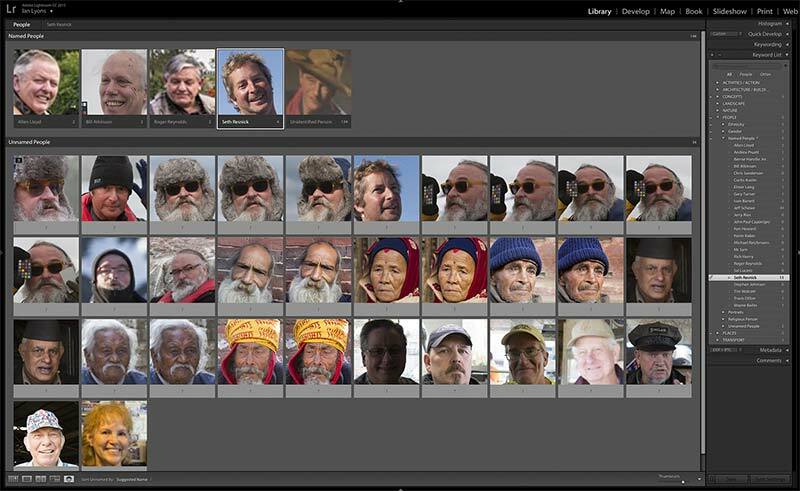 Face Tagging - the feature allows users to automatically create an index of faces within their Lightroom catalog and tag these faces. There is also a tool for manually drawing 'face regions'. Typically, this tool is used to include faces within the index that the automatic facial detection algorithms failed to find. Photo Merge - this version of Lightroom supports two types of photo merging. That is, Panorama and High Dynamic Range (HDR). By selecting multiple photos a set of bracketed or panoramic stills are created. 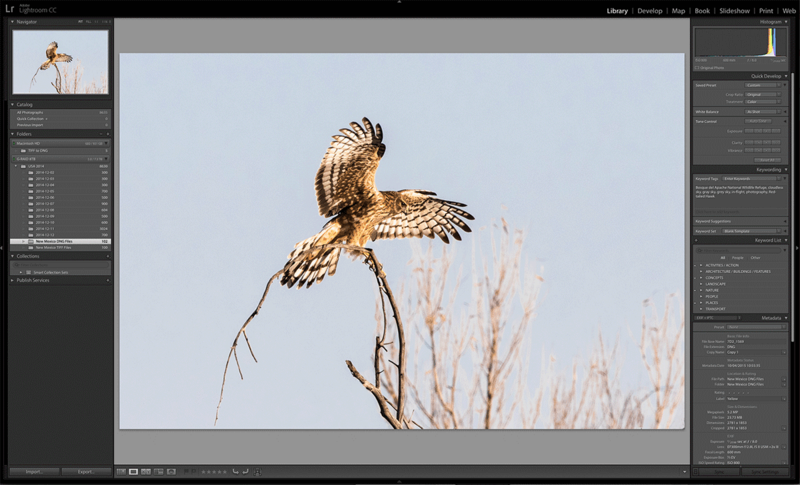 Unlike Photo Merge in Photoshop this feature provides a raw photo in to raw photo out workflow. A headless mode is also available. Import to a Collection - using this feature it's now possible to import photos directly into a collection, including a collection synced to Lightroom mobile. Activity Center - an Activity Center has been added to the ID plate. The Activity Centre can be used to show progress and or control of background operations such as preview rendering, indexing for Face Tagging, and Lightroom mobile sync. Keyword Painter - the Keyword Painter tool can now be loaded with keywords from any of your saved keyword sets. 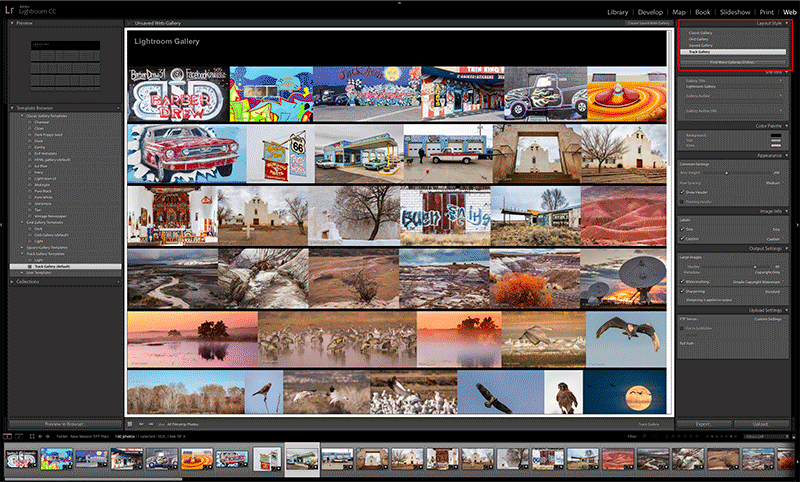 Library module odds and ends - filtered collection lists, ability to reset preferences when launching Lightroom, 'auto' for standard-sized previews, and many more. GPU Acceleration - assuming your computer graphics card supports GPU acceleration then Lightroom can use the Graphics Processing Unit (GPU) to speed up interactive photo editing. This provides real-time or near-time updates to the photo while making adjustments in the Develop module using sliders. Filter Brush - this tool allows you to add to an existing gradient or radial mask using a brush. Likewise, you can also remove from the mask. 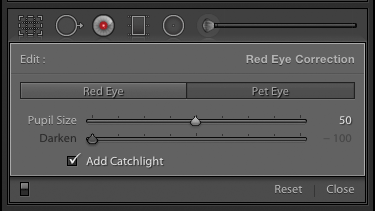 Pet Eye - similar to red eye, the Pet Eye tool is used to correct unnatural looking highlights in animal eyes. Pan and Zoom - slideshows can now include pan and zoom effects (Ken Burns) with the amount controlled using a new Pan and Zoom slider. Multiple audio tracks - up to 10 music or voice tracks can be added to each slideshow. Using the new 'Music Panel' new tracks can be added, reordered or removed. Audio tracks can be played sequentially or in the order of your choosing. 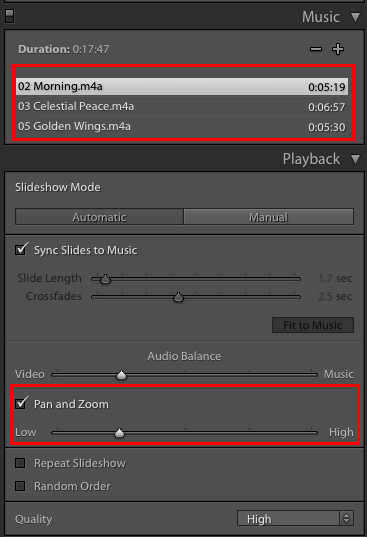 Sync Slideshow Transitions to Music - a simple checkbox within the 'Playback Panel' allows Lightroom to automatically synchronise photo transitions to match the tempo of the selected music tracks. Lightroom now uses the Chromium Embedded Framework for improved performance. As with Map the Web module now uses the Chromium Embedded Framework. These galleries are designed to work more with desktop and mobile web browsers. Ideally, you should refer to the Release Notes for a more comprehensive list of new features and enhancements. Typically, these will also include information on Known Issues and limitations. Back in January this year when Adobe announced the future system requirements for Lightroom. The most important being the requirement for the Operating System (OS) to be 64-bit. The full list system requirements for this latest version of Lightroom is shown below. 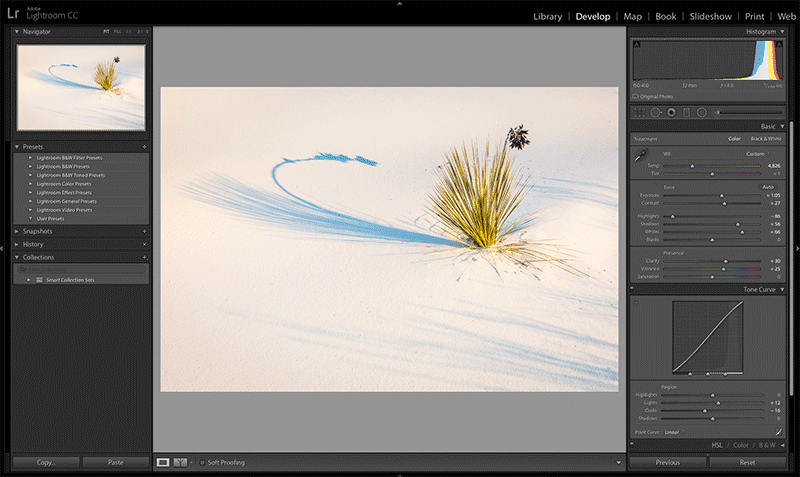 Lightroom now comes in two version. A perpetual license version and a version for Creative Cloud. The both contain exactly the same feature set. However, we are advised that the perpetual license version of Lightroom will be around for the foreseeable future I think it's important to remind readers that it doesn't provide access to Lightroom mobile or Lightroom web. It's also more difficult to install and remove than previous versions. Why? The answer is - as I mentioned above Lightroom is now a first class citizen of Creative Cloud (CC). This means that Adobe will likely put even greater effort into switching perpetual users over to the Creative Cloud for Photography Plan, especially when Photoshop CC is included in the deal. With each new version we get a new splash screen. In this case the branding in bottom left corner will indicate whether the version installed on the the computer is a perpetual licensed or Creative Cloud version. From an installation perspective the consequence of integrating Lightroom into CC is that everyone (i.e. perpetual license and CC customers) are now be required to sign into an Adobe ID account. 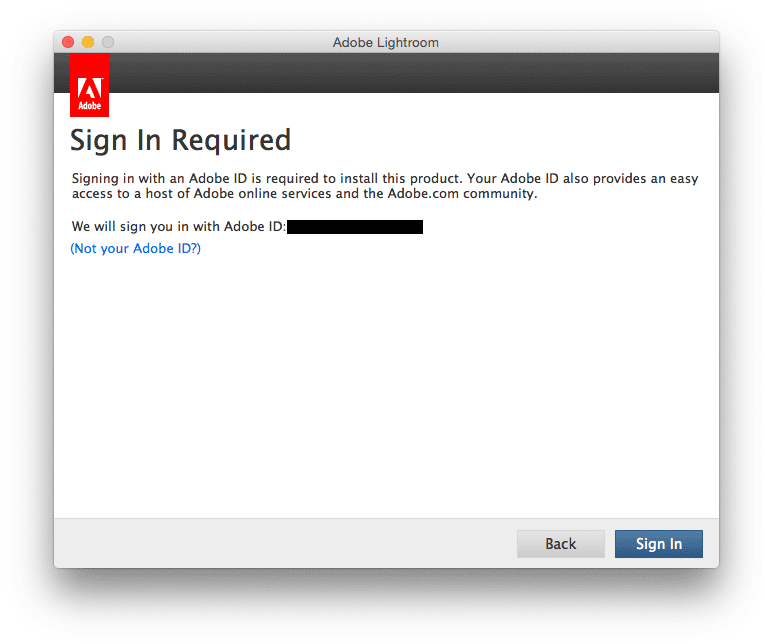 If a customer doesn't have an Adobe ID they must create one. This means an active Internet connection is essential whether you intend to continue with the perpetual licence version (Lightroom 6) or have chosen the Lightroom CC route. In the absence of an active Internet connection the application can only be installed in Trial mode, and believe me this is easier said than done. After signing into their Adobe Account perpetual license users will also need to type in the Lightroom serial number while Creative Cloud customers can simply progress with the installation process. I should also point out that a single Adobe ID means that Lightroom can only be operational on two computers. If you want to run it on a third computer you'll need to deactivate one of the other two first. Long time Lightroom users will already be familiar with the process of upgrading catalogs each time a new version ships. The good news for those who have not experienced the catalog upgrade process before is that it's fairly straight forward, albeit a bit time consuming. It's also worth mentioning that your existing catalog will not be replaced or even deleted during upgrade. Therefore, if a problem occurs during the upgrade you'll still be able to use the older catalog. 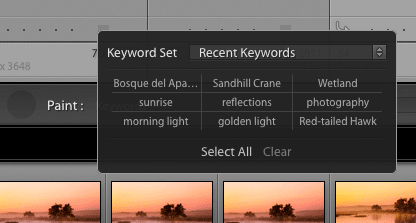 As mentioned above, the Lightroom UI hasn't seen much in the way of change since Lightroom 1. Sure, we've had new modules, new panels, etc, but the ability for user configuration is still absent. Personally, I don't have a problem with this, but I'm conscious that a lot of Lightroom users do. Anyway, there is no point in dwelling on what hasn't happened, especially when there are new features in Library to discuss. The Library continues to be at the heart of Lightroom in so far as it's the module that provides most of the tools for managing your photographic assets. Imported photos can be viewed in the Library in various modes or views. These include the now familiar Grid view (G), Loupe view (E), Compare view (C) and Survey view (N). Each of these views is intended for a specific purpose, but users may find one view more useful than others. For example, Grid view allows the user to see large numbers of photos as thumbnails whilst at the same time providing a workspace for applying metadata, labels, ratings, keywords, flags and even quick development adjustments to photos in bulk. As with previous versions of Lightroom, the Loupe view restricts these actions to a single photo. Compare and Survey views are designed to make the tasks of rating and flagging easier. The new kid on the block is People (O). Face tagging has been on the wish list of many Lightroom users since the very first public beta back in 2006. So, I expect some will be jumping for joy that it's finally here. Personally, facial recognition and face tagging holds little interest for me. That's not to say that I haven't spent an inordinate amount of time over recent months try to incorporate face tagging into my Lightroom workflow. Unfortunately, it hasn't been possible to do so because the way it has been implemented means that people keywords/tags are treated separately from conventional keywords. Sure they all appear on the Keyword List, but the workflow for assigning a 'name' to a face in People view is completely separate from assigning traditional keywords used to describe the photos other content. In effect, any user who chooses to adopt face tagging will likely find themselves keywording or tagging each photo twice. 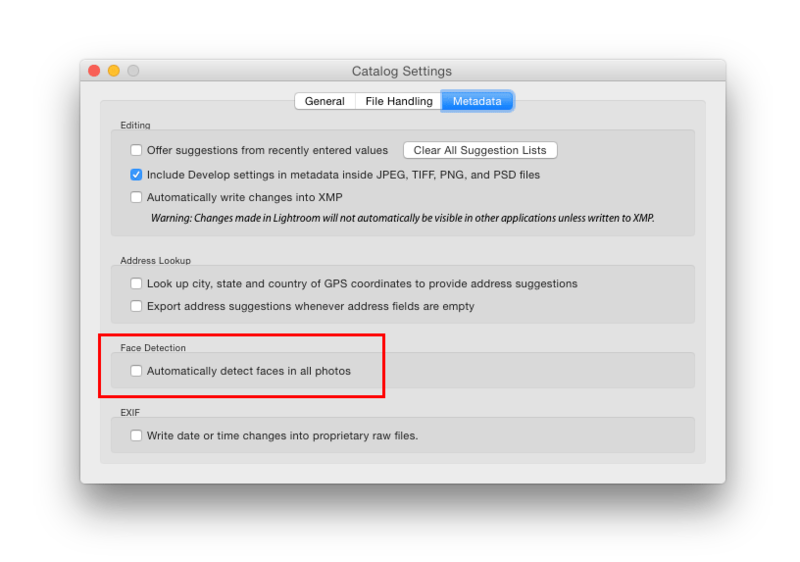 The facial recognition algorithm requires Lightroom to build an index of your photos to operate. Indexing will ask to turn on the first time you enter People view for your entire catalog. If catalog-wide indexing is not turned on, then indexing will run just for the selected source (i.e. folder or collection) and only while in People view or loupe view when the Draw Face Region tool is activated. The time required to index your catalog can be significant. However, if you have Smart Previews or embedded JPEG thumbnails in your raw files (most do by default) then these will help speed up the indexing process. This is because Lightroom doesn't need to read the entire raw file off of disk. If a photo is offline (and no Smart Preview is available) Lightroom will not try to index it. When indexing is turned on for the whole catalog, Lightroom will automatically index offline photos when they come back online. The following screenshot shows where you can enable/disable automatic catalog indexing. You can access the People view via the button on the toolbar, or via the View menu. Also, tapping on 'O' key in Library module will open People view. People view will show all the detected faces in the currently selected source. 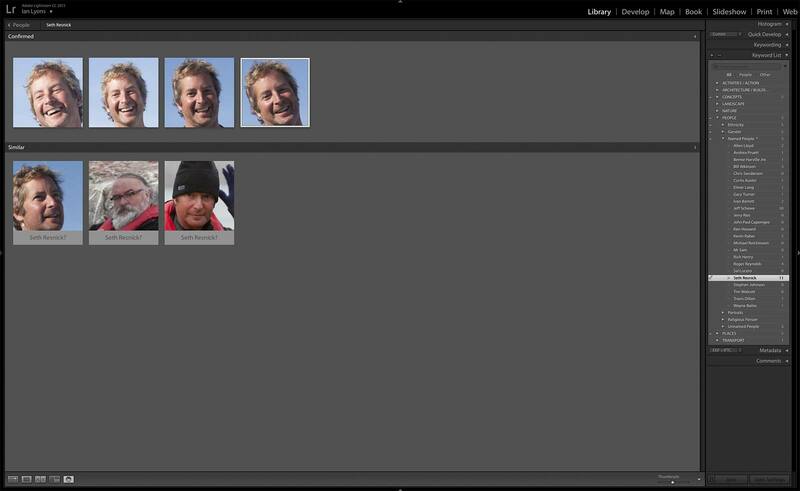 If Lightroom is confident that several faces are in fact the same person, it will group them together into a stack. In above screenshot you'll see that I have already named one group of like faces (Seth Resnick) with the result that Lightroom has moved this group (stack) to the Named People section. I'm also in the process of naming another group (Jeff Schewe). Also, a quick scan of the grid (click the screenshot for a larger view) will also show that some of the faces found by the facial recognition algorithm are not actually faces. These can be quickly removed by clicking on the X button that appears on bottom left corner when the mouse is floated over the thumbnail. This removes the face region mask. However, it's important to note that deleting the face region mask means that there is no way to name a real face in future. I'll speak to this below. Above screenshot also includes a lot of faces for people I photographed on a visit to Nepal in 2012. I don't know the name of any of these people. Therefore, my preference is to give them all the common name 'Unidentified Person'. Doing, so means that Lightroom will retain the face region mask within the catalog. I also find this approach useful when I've forgotten a persons name, as it allows me to add it later. At this point it's worth noting that the default sort order in People view is Suggested Name. This will sort the unnamed people alphabetically by suggested name first, and by stack size second. The other sort orders are: Filmstrip Order, Stack Size and Popular Names. When you name a face, or a stack of faces, the faces move from the Unnamed People section of the grid to the Named People section of the grid. This next screenshot highlights some of face recognition's more quirky behaviour. For example, notice how many pairs of identical faces that the algorithm has failed to group as the same person. Also, notice how many faces for people I've already named that the algorithms still hasn't even suggested a name for (i.e. Seth and Jeff). You may be asking why this should be so. Is it that they're wearing spectacles, have facial hair are wearing a hat? I don't have an answer and to date not be able to get one from Adobe. Other functionality that can be used to help speed up the process of naming faces includes: dragging and dropping faces from Unnamed to Named stacks, selecting multiple face thumbnails and naming the selected faces at the same time, and when typing names in People view, auto-complete will suggest and filter other person keywords as you type. In this next screenshot I've already entered Find Similar Faces view by first selecting the thumbnail for Seth Resnick in the named people section then double clicking. Lightroom displays only those faces that the facial recognition algorithm believes to be the same person. In this example, two of the thumbnails are of Seth, and I can click the checkmark on the bottom right corner to accept the suggestion. The other is actually Jeff Schewe. Is there a common facial feature here that I can't see or is Lightroom confused? This last last example and associated screenshot demonstrates how we identify faces that the facial recognition algorithm fails to find. Finding such faces manually isn't particularly easy, but you'll need to establish your own approach to overcoming this particular issue as space and time prevent me from describing my own. Once the missing faces are found you can click on the Draw Face Region button on the toolbar then simply drag the mouse across the face are on the photo as shown below. You can then type the appropriate name into name box at the top of the region boundary. This particular photo is of Elmer Long of Bottle Tree Ranch fame. The photo was taken during my Route 66 road trip in 2013. Again, I have to wonder why Lightroom didn't find this or any other photo I have of Elmer. I've listed some tips below for using this particular tool. The Draw Face Region tool is only available in Loupe view. The Draw Face Region tool is automatically selected whenever entering loupe from People view, though it can be manually selected in Loupe view at any time by clicking on it on the toolbar. When you double click on a face in People view, it takes you to loupe view with the Draw Face Region tool active (and face regions visible). Double clicking in loupe view will then take you back to people view. The face regions are displayed or hidden in loupe view depending on whether or not the Draw Face tool is selected. 'O' toggles the People view. When you press the Option/Alt key and scroll the mouse over a face stack, Lightroom shows a preview of all the faces in the stack. Delete key in People view will delete the selected Face region. In People view, the Find Similar Faces context/right-click menu item takes you to Single Person view with that face as the search face. Right-clicking on a face in People view gives you context menu items which will take you to the Folder or Collection which contains the photo. The 'S' key expands or collapses a selected stack in People view. You can also click on the stack badge to expand and contract the stack. You can right-click on existing keywords and choose Convert Keywords to Person Keywords. This will convert them from traditional keywords to Person keywords. 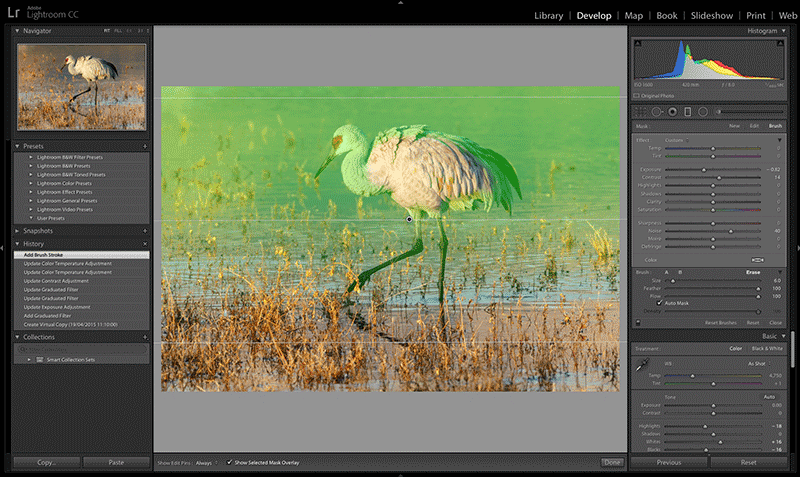 Unfortunately, Lightroom makes their use more complex than it should be. If you convert the parent keyword in a hierarchical structure, all the child keywords will also be converted to Person keywords. If you apply an existing keyword to a face in People view, the keyword will be automatically converted to a person keyword. You can also right-click on a keyword and select Put New Person Keywords Inside This Keyword to set it as the default parent keyword for all new Person keywords. Typically, you would do this when you've already got a well structured Keywording system in place and want Lightroom to place new Person keywords into it. The last feature I want to draw attention to is one that I suspect many users will not notice. In the screenshot shown below you'll see that there is a new toggle button on the top right corner of the Keywording panel. Clicking on this button opens a new tab bar on which you'll find 3 filters All | People | Others These filters can be used to pare down the keyword list from all keywords to either People or Others. These filters are probably more useful to those who choose to work with a flat keyword list and much less so to those who use a hierarchical list. After a preview of the merge is generated, select the desired options in the merge preview dialog and click the Merge button to start a full-size merge. The full-size merge is performed in the background so you can continue to edit other photos or start other merges while you wait. 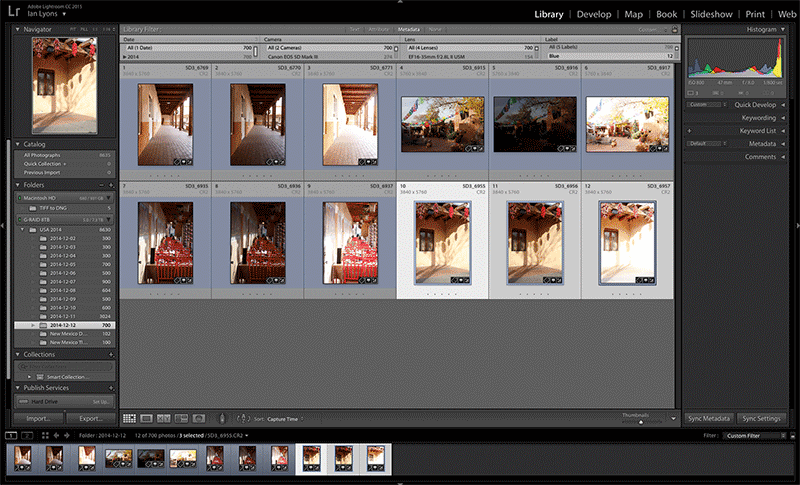 Once the full-size merge is complete, the resulting DNG file will be added to the Lightroom Catalog and will be available for further editing. When merging raw files, the merge is performed on the raw image data so that the result is virtually the same as demosaiced raw file (and has all the editing flexibility that comes with raw). The merged file is 16-bit floating point, which is particularly important when working with HDR. The Photo Merge menu options (i.e. 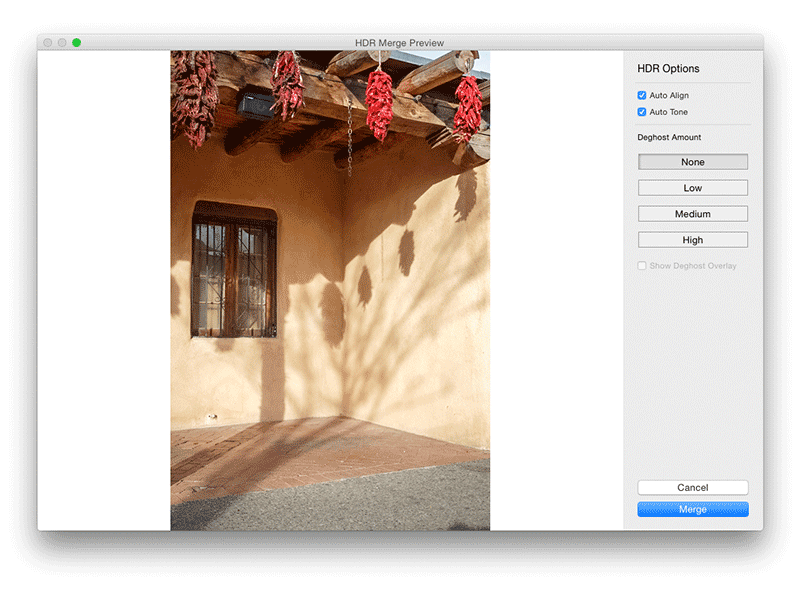 Panorama & HDR) are only be available if two or more photos are selected, or when a single closed stack is selected. Lightroom requires certain minimal metadata to be present to perform the merge so it should show an error if you try to merge photos of different sizes, focal lengths, etc. When merging panoramas you will see a warning if Lightroom was unable to automatically locate a lens profile for the selected images. In this case, you can manually apply a lens profile to the selected images and Lightroom will use that when merging the images. Lens corrections are always applied before merging. 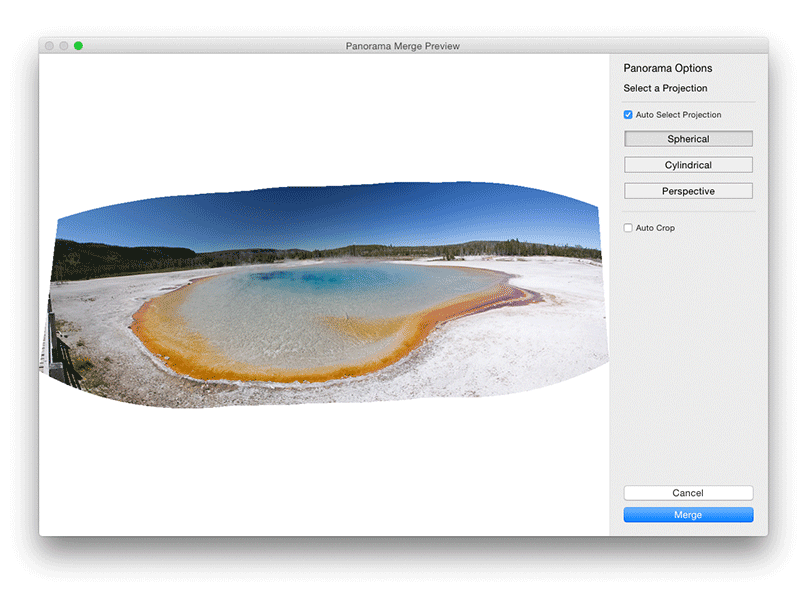 The panorama merge dialog is resizable, and the preview within can be panned and zoomed. Note that, because preview generation for panorama merge is very intensive, the preview size is limited to 2048 pixels across the long edge on retina displays (max of 1024 pixels on non-retina), and zooming or resizing will not increase the maximum preview size. Auto – the application automatically chooses between Perspective, Cylindrical and Spherical layout. Perspective – this option selects the middle photo as the reference. The other photos are transformed so that the overlapping content across the photos is matched. Cylindrical - this option will reduce the 'bow-tie' distortion that can occur with Perspective option. It does so by displaying individual photos as on an unfolded cylinder. Overlapping content across files is still matched. The reference image is placed at the center. Cylindrical is best suited for creating wide panoramas. Spherical - this option aligns and transforms the photos as if they were for mapping the inside of a sphere. If you have taken a set of images that cover 360 degrees, use this for 360 degree panoramas. The Auto Crop option is only available when merging panoramas. You can reset or change the crop on the full size result using the Crop tool. As with Panorama merges, changes to any merge settings will trigger a new preview merge, cancelling any previous preview generation that is in progress. Again, the Cancel button aborts the merge session and the Merge button performs the final merge using full resolution versions of the selected images. Aligned HDR results are always automatically cropped. You can reset or change the crop on the full size result using the Crop tool. Overlay toggle to show the deghosted areas. On Mac, the keyboard shortcut ‘O’ enables or disables the mask overlay, and Shift+O will cycle through the mask overlay colors. Tip: merging two photos often produces better results than merging 3 or more photos. 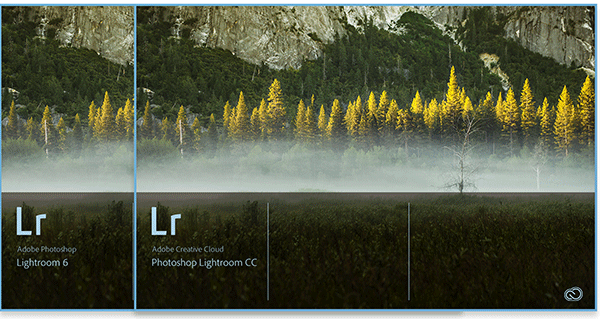 Adobe have added an Activity Center to Lightroom. This is accessible by clicking on the ID plate. The Activity Center shows the progress of background operations. The operations currently shown in the Activity Center include Lightroom mobile sync, Indexing for Face Tagging, and Address Lookup. allows any background processes to be cancelled. When you first activate a feature viewable in the Activity Center, the Activity Center will pop open and show a bit of explanatory text. By default, the only background task that shows up in the ID plate area is sync progress. The other background tasks still show in the Activity Center itself. A right-click in the ID plate area lets you control which background tasks show in the ID plate area. The Keyword Painter can now be loaded up with keywords from any of your saved keyword sets. With the 'Keyword Painter' tool active, press shift to bring up the Keyword Set UI. In screenshot shown below you can see the Keyword Set panel anchored to the toolbar. It is possible to add an entire keyword set at once to the keyword eyedropper by using the Select All button. 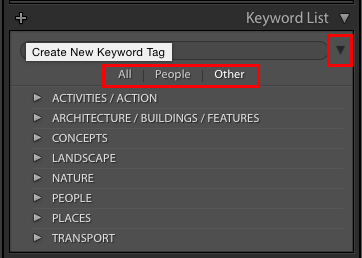 All currently selected keywords can be removed at once with the Clear button. The Collection list can now be filtered in the same way that the Keyword list can be filtered. To access, click the '+' in the header of the Collections panel, and turn on Show Collection Filter. Ability to reset application preferences on launch by holding down Option-Shift (Mac) or Alt-Shift (Win). A new standard preview size called Auto. This setting will automatically build previews at your monitor resolution (max size of 2880 pixels). You can shift-click in Quick Develop for smaller adjustment increments (1/6 stop rather than previous 1/3 stop). Percentage options have been added to the image resizing section of the Export dialog. There is now a preference to make badges in the filmstrip ignore clicks. You'll find this in the Filmstrip section of the Interface tab of the Preferences. Flag and Rating categories have been added to the Metadata filters. Convert proprietary raw files to DNG on import is now a separate background task that runs after photo import is complete. Thumbnail loading performance is improved after an photo import. Photo export speed has been improved. The catalog backup dialog now contains a pop-up menu that allows you to change the backup frequency. Therefore, you don’t need to go into the Catalog Settings to do this. Catalog backups are now also compressed to a Zip file. This should reduce the risk that a user mistakenly opens a backup catalog instead of regular catalog. Camera + Lens and Camera + Lens Setting have been added to the Loupe Info options in the View Options dialog. The Pinstripe background texture option has replaced with a new Darker Gray option under Background colours. 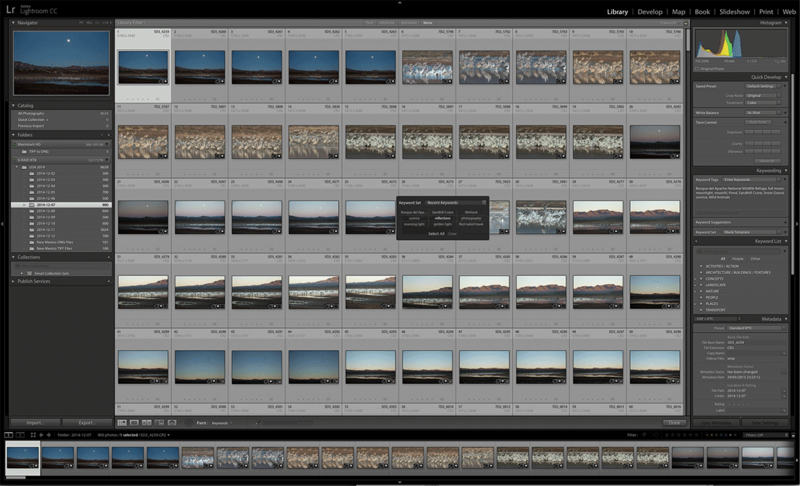 Moving photos to a different folder in Lightroom is much faster than in previous versions. At this point you may well be wondering - "is that all that's new in Develop". Sadly, as far as headline features go these are indeed all that is new. To be fair to the engineering team, incorporating GPU support has required a significant amount of work, and I suspect this is only the beginning. Anyway, I have listed other other lesser features and enhancements at the end of the section. Hopefully, some of these will prove beneficial to your workflow. As of this version Lightroom can use your computer's Graphics Processing Unit (GPU) to speed up interactive photo editing. This provides real-time or near-time updates to the photo while making adjustments in the Develop module using sliders. GPU acceleration is particularly helpful when using the new breed of high-resolution screens, such as 4K and 5K displays. GPU support is enabled by default. To disable GPU support, go to the new Performance, tab in the Lightroom preferences, and uncheck the Use Graphics Processor checkbox. When enabled, Lightroom will automatically determine whether the system's GPU can be used to accelerate image drawing. If yes, Lightroom will display the name of your graphics card below the checkbox. Otherwise, Lightroom will display an error message. Tip: GPU acceleration is currently only available within the Develop module. Therefore, users can expect to see no benefits from this feature in any other module (e.g. preview rendering in Library module is not assisted by the GPU) . Furthermore, the GPU will only accelerate interactive photo editing on the primary display. It's important that you make sure that your video drivers are up to date. On Mac, video drivers are updated via OS update, but on Windows, the OS is not always accurate and may tell you that outdated drivers are just fine. Therefore, it may be necessary to visit your graphic card manufacturer's web site to download a dedicated video driver update utility. Again, this is only necessary if you are having problems or the drivers are known to be outdated. The Filter Brush is not completely new as it has been available in Camera Raw 8.x (Photoshop CC) since last year. As such, many users may already be familiar with its operation. If you fit into this category of user you can scroll down the page to the next new feature (i.e. Pet Eye). What does the Filter Brush do? It allows you to add to your existing gradient or radial masks using a brush. You can also remove from the mask as in the example shown below. For above photo I dragged a Gradient Filter from the top of the photo downwards. The gradient has an Exposure setting of -0.82, a Contrast setting of +14, and Noise by +40 (i.e. a reduction). This helped darken the background thus reducing the brightness of the water. Unfortunately, it also resulted in the main subject (Sandhill Crane) also being darkened more than I wanted. By selecting the new Brush option and setting it to Erase mode with the same settings as used for the Gradient Filter I was able to remove the gradient mask from areas I didn't want it to affect. Tip: I find turning the coloured overlay ('O' key) makes the task of brushing away a gradient filter adjustment a lot easier. Using Shift+O keys it's possible to alternate the coloured mask between the red, green and white overlay. You can also use Shift+T keys to toggle between 'filter edit' mode and 'brush' mode, or click 'Brush' in the 'Mask' area above the control sliders. The last of the new headline features in the Develop module that I want to discuss is Pet Eye. It is broadly similar to Red Eye correction for humans in so far as Pet Eye corrects unnatural looking eyes in animals. Under the Red Eye Correction tool the Pet Eye option allows for one-click detection and correction of green, yellow and other pupil discoloration sometimes caused by camera flash in animal photos. The Pet Eye tool also auto applies a synthetic catch light, that can be turned on or off, and repositioned manually. Unfortunately, from a collection of in excess of 5000+ animal photos I have none with the issue this new tool is intended to help fix. Therefore, I can't demonstrate how it can be used. Actually, I'm not even sure how useful, if at all, this tool will be to serious photographers. I suspect I won't be the only person with this question on their mind. New Auto button added to the Crop Overlay (R) tool. This allows the customer to apply an adjustment similar to the 'Level' option in Upright from the Crop Overlay panel. Note the same thing can be accomplished by shift+double click on the 'Angle' slider label. Adjustment Brush strokes can now be repositioned by selecting and dragging Edit Pins. Note that you can revert to the previous behaviour (to make adjustments to the brush’s develop adjustments) by using Option/Alt+drag up or down. 'Connect the dots' with the local Adjustment Brush (K), by pressing the Shift key, then clicking with the local Adjustment Brush tool. This will draw a straight line between each click. You can constrain your local brush adjustments using Shift and clicking. This will draw a straight line (vertical or horizontal) between each click. Mask Overlays for the Gradient (M) and Radial (Shift+M) filters, accessible via the same menu commands and keyboard shortcuts that are used to show the mask overlay for the local adjustment brush (i.e. 'O' and 'Shift+O'). 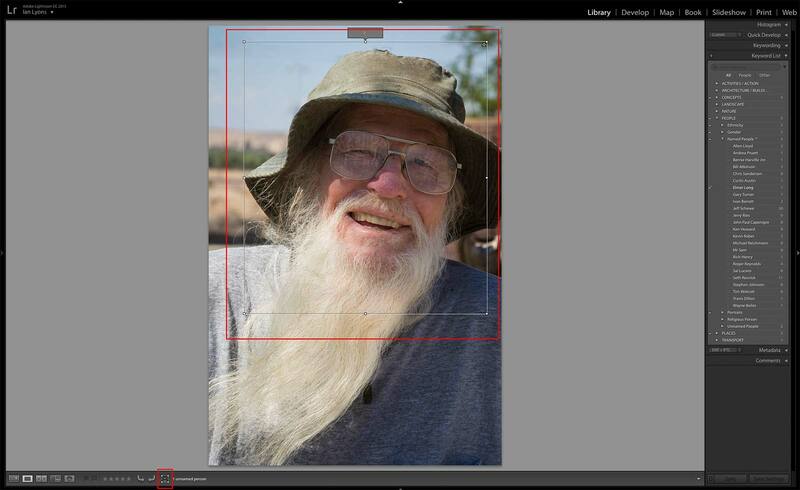 Lens correction panel now indicates if a photo has built-in lens correction applied. This is useful for particularly micro 4/3s and mirrorless lenses which can be automatically adjusted using opcodes. New keyboard shortcut to cycle through Upright modes in Lens Corrections panel: Control+Tab. You can now preserve your crop using Option+Control+Tab on Mac. History panel load time is improved. Photo switching time is reduced, particularly when working with a large list of Develop presets. These new HTML 5 galleries are designed to work well with both desktop and mobile web browsers. If you are using Lightroom mobile then the Track gallery will be familiar to you. Time will tell whether web gallery developers will use their skills to design additional HTML 5 galleries. As mentioned above, the Slideshow module includes a number of new features. These are intended to provide users with more options when creating slideshows. This feature is enabled using a checkbox within the Audio Balance section of the Playback panel. Using the Pan & Zoom slider you can set the amount of movement you’d like. Setting the slider to the Low end of the scale will produce less panning & zooming than would be the case when the slider is set to the High end of the scale. Lightroom now supports up to 10 audio. The audio tracks will be played sequentially in the order of your choosing. You an add, reorder, or remove them in the Music Panel. A checkbox allows you set configure Lightroom to automatically synchronise photo transitions to music. When this feature is enabled, Lightroom will make slide transitions based on an analysis of the music. Tip: setting both Sync Slides to Music and Pan & Zoom to on can result in the photo transitions stuttering, especially if slideshow is set to preview at high quality. Therefore, I suggest carefully preview any of your shows that have both features enabled. Fine tuning the amount of Pan & Zoom can help reduce the stutter. Aspect ratio preview - slideshows can now be previewed at your screen aspect ratio, or they can be previewed at your intended output aspect ratio (either 16x9 or 4x3). Preview Quality options - select a lower quality to preview playback more quickly. This setting will affect only the quality of playback within the application. I find that Standard Quality is usually adequate when either Sync Slides to Music or Pan & Zoom, but not both are enabled. If both are enabled then High quality previews provided a much better idea of the quality you can expect for photo transitions. Exported slideshows will always be created at full quality. If you've read this far you'll probably be wondering if I've somehow missed something, after all this is a full rather than a dot release. Unfortunately, it is, and I suspect many long time Lightroom users will be disappointed. Some might also question whether there's enough to warrant the upgrade. Those of who have been using the application from the very first public beta (January 2006) will recall that the list of feature requests included many that have since been implemented. I think facial recognition and face tagging are probably the last of those original requests. So, in that regard Adobe have delivered all of the headline features requested in 2006/7, and many more since. For example, video support, tethering and Lens Corrections. In the meantime, the use of mobile devices such tablets and smart phones seems to have gone from a figment of the imagination to the next big thing in photography. In some instances photographers are using these devices as their primary means of capturing, editing and sharing photos. Adobe, Apple and others have recognised this, and the ability to sync desktop photo libraries with mobile devices appears to be their new focus (forgive the pun) of attention. Such has been the level of interest in this area along with the considerable commercial opportunities it brings that Apple have dropped Aperture from their product line-up, and replaced it with a much more basic photo editing application that also incorporates a very power but simple to use photo syncing system. Adobe have also turned their attention in the direction of mobile photography, but unlike Apple have continued to develop Lightroom desktop. However, I can't help but feel that the rapid shift to mobile photography particularly how some Lightroom users want to capture, edit and share their photos will influence future features in Lightroom desktop.